I’m a great believer that there are very few products made for men that women can’t use also (Tena pads aside, the truth can also be found in the reverse). The added bonus is that men’s products are nearly always, always cheaper. Case in point: Anthony for Men – a great range – reasonably priced, paraben and mineral oil free (jig) and single-handedly the most popular brand with all of the men in my house (headcount: husband, 21 and 19 year old sons – for reference!). 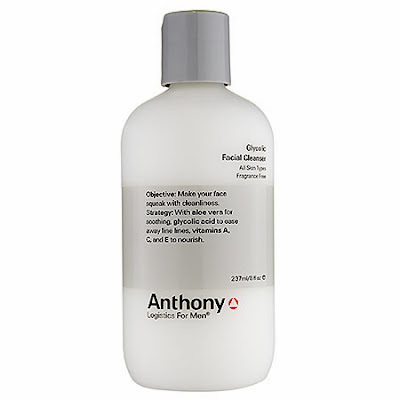 I’ve used the Glycolic Cleanser on and off for a few years and at last night’s Space NK event I recommended it to a number of people which reminded me to blog about it! It contains 4% glycolic acid but counteracts it with an aloe vera hit so is very soothing. It does contain everyone’s favourite panic buzzword of methylisothiazolione – but its in a very small % (judging from the inci). I personally haven’t experienced any adverse effects from MI (to my knowledge) – and am fine using this. Just a little FYI. If you had a particularly bad ezcema/psoriasis prone skin I’d maybe sample this first – but for everyone else – especially acne prone skins – this is great – either as a quick morning cleanse or a second cleanse in the evening after MU removal. And boys. I suppose we should let the boys use it too. Next Post When to cleanse.